Meadow Lake Airport, located in the shadow of Pike’s Peak, about 15 miles to the northeast of City of Colorado Springs Municipal Airport in Colorado, and about 20 miles from the Air Force Academy, is one of the largest pilot-owned airports in the United States. With over 450 aircraft based there, it is a hub of general aviation activity in the region, relieving operational pressure from the air traffic controllers at both Denver International and the Colorado Springs Airports. Several Fixed Base Operators (FBOs) also call the field their home, among them are Classic Air, which primarily rents Piper airplanes to flight students and pilots, and American Aviation, which rents mostly Cessna airplanes. On the afternoon of December 7th, 2006, Terry Brookham, an instrument-rated private pilot, for over 30 years experience as a pilot, rented a Piper Archer from Classic Air to practice his landings and take-offs at night, in order to maintain his night currency, hopefully in time to make it to his karate lesson that evening. The Piper he rented for that winter afternoon was serial number 28-4917, now carrying the FAA tail number N6487J. Brookham was no novice to flight. A graduate of Aviation High School in Redondo Beach, California (a bit of a misnomer, as the school’s name referred not to flying, but rather the road on which it was located), Brookham’s desire to fly was sparked when he was enlisted in the United States Navy. There, aboard the aircraft carrier USS Hancock, he served as a plane captain on the ship’s flight deck. After his service was complete, the “brown shirt” worked towards and completed his private pilot’s license in 1975, adding an instrument rating a few years later. From 1984 to 1995, he flew as a mountain/mission pilot for the Civil Air Patrol, with one “find” and two “saves” to his credit. He also flew skydivers for two years, flying his own Cessna 206. In the time since, he had become self-employed with his wife, Debbie, selling premium pet food, and working towards retirement. The winds that afternoon favored Runway 15, a 6,000 foot long by 60 feet wide strip of asphalt. His engine set at 2200 rpm, and the sun having set at 4:40 PM, Brookham was flying the downwind leg of his first pattern, to the northeast of the runway, and starting to descend when, at around 5 pm and for no apparent reason, his engine lost power. Brookham had an immediate feeling of something being very wrong. His eyes darted to his vertical speed indicator, showing a descent of 500 fpm. Brookham immediately executed his emergency procedures for an engine failure. Referring to his checklist, he turned on the plane’s carburetor heat, and advanced the throttle forward, the engine showing no response. Checking his systems from right to left, in an attempt to determine the cause of the problem, he checked the carburetor heat, fuel mixture, engine throttle, and magnetos, in an attempt to restart the engine. The engine sputtered slightly, but still no power. Finishing with a check of his fuel systems, and unable to restart the engine, Brookham glided downwards. But, with only 40 knots of airspeed, in the pitch black of the night, and with a wind-milling propeller, his options were limited. He chose his base to land, lining up with the east-west road running near the airport, Judge Orr Road, and continued to glide downward for a forced landing. He hoped to land on Judge Orr Road, and have the airplane stopped by the time he reached the intersection of Highway 24. Brookham stated, “I was just trying to get the airplane down safe.” He knew that there were homes in the vicinity of the airport, and didn’t want to hurt anyone. But, in the darkness, in the seconds before touchdown, as he tilted the plane’s nose downwards, he saw a frightening pairs of lights – those of an oncoming car! Maneuvering to avoid a potentially deadly collision, Brookham swerved to the left, cutting a set of power lines, and smashed into a Cottonwood tree near the intersection of Cessna Drive and Judge Orr Road. The airplane became lodged in the tree, crushing both wings rearward, snapping the engine nearly off, and wrinkling the vertical stabilizer. I’m alive, thought Brookham, after the sickening sound of crunched metal passed. Dazed from the impact, and with fuel leaking out of the plane’s wings, Brookham sat stunned. Like an angel of mercy, an active-duty Air Force officer from Schriever AFB, was driving nearby and pulled up to the site and called up into the tree, to see if anyone was alive in the wreck. “Yeah!” Brookham called back down. The Air Force officer told Brookham of the leaking fuel, and advised him to get out of the plane as soon as possible. Brookham first shut down all of the plane still-functioning electronics, and began to egress from the craft. However, the design of the Piper 180’s single cockpit door precluded his exit. The crash warped the fuselage shape of the plane, and sealed the fuselage in a coffin-like matter. The only option for a safe exit was through the windows. Brookham kicked out the left side window, and began to climb down the tree, the smell of 100LL filling the air. Almost as if it had been planned, a local roofer’s truck pulled up to the tree to lend a hand with an extension ladder, greatly aiding Brookham in his climb down. In the climb, he received the only injuries of his ordeal – a pair of scratches above his left eye. Brookham gave his thanks to all those who helped him, as emergency workers closed Judge Orr Road because of debris from the crash, which caused the power to go out for the hangars at the airport, as well as about nearby 100 homes, for around two hours. But before the Falcon Fire Department and Sherriff arrived on site, one group got there before them all – the news media! After a visit to the responding ambulance, and giving several interviews to officials, Brookham headed home. Brookham did not turn on the carburetor heat, because the manual for the Piper does not call for that when closing the throttle, unlike in a Cessna, nor had he ever been taught to do that by any of his instructors. Knowing this, the National Transportation Safety Board (NTSB) concluded that the likely cause of the accident was the “loss of power due to carburetor icing”, with contributing factors to the accident being weather conditions conducive to carburetor icing, unsuitable terrain available on which to make a forced landing, and, of course, the tree. One month after the accident, Terry was up and flying again. He stated that his survival might have had something to do with an angel, saying “Oh I definitely had one in the co-pilot seat, no doubt about it.” He credits all the great instructors he has had over the years with helping save his life. He advises that, in the same situation, that pilots need to ride the airplane down, and keep their heads about them in the event of an emergency. Well, that, and a well-placed Cottonwood tree, which still stands to this day, albeit a few branches trimmed away to help remove the plane’s wreckage. No one has publicly claimed credit for creating it, but the juxtaposed image of a crashed plane with a sign offering flight instruction seemed to be the perfect fodder for the e-mail inboxes and blogs of people, pilots and non-pilots alike, everywhere. An additional, yet subtle, jab to Classic Air is that one of their airplanes is in the photo, yet the name of their airfield competitor is featured so prominently. However, that photo is the product of some clever use of photo-editing software. The two signs do stand near the tree. However, they face the opposite direction from which the photo was taken. 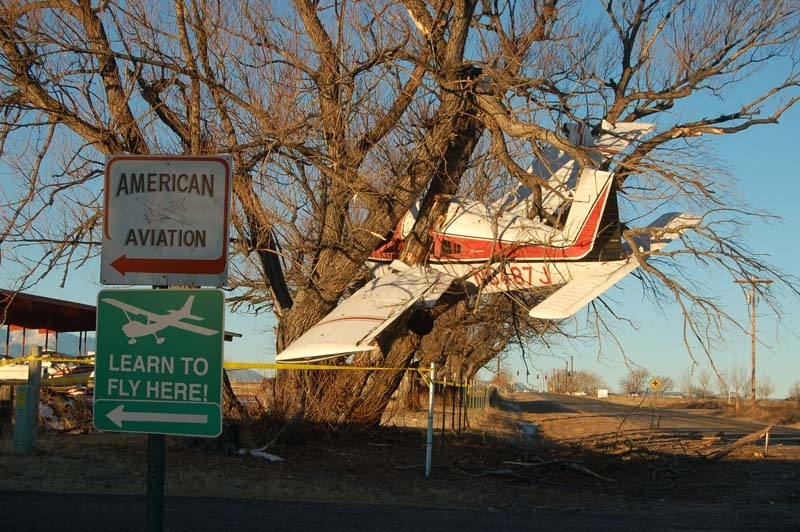 The image of the two signs was transposed onto the image of the plane lodged in the tree to produce the comical image. Nevertheless, the photo has also been published in numerous aviation publications, as an interesting snapshot that seems to strike a chord with readers everywhere. “It’s funny!” said Brookham, in response to the photo.